Tsai Eison set foot in Taiwan 20 years ago from Kuching in East Malaysia. 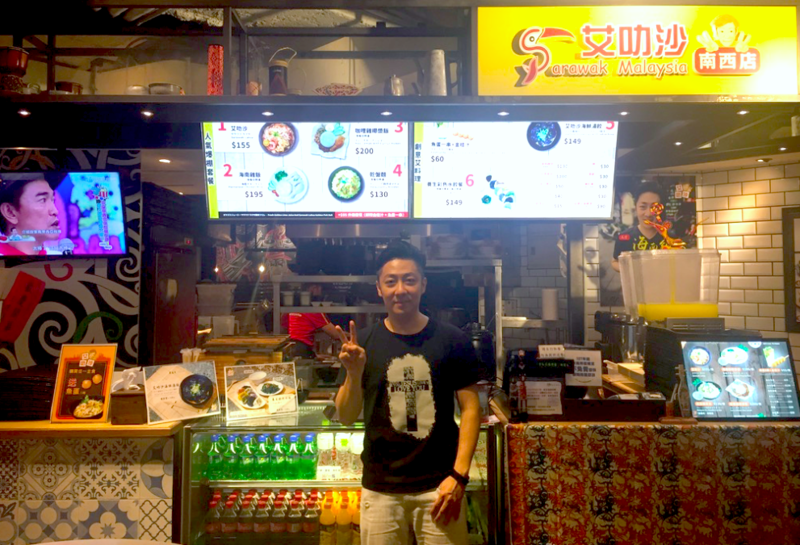 TAIPEI (Taiwan News) – Popular singer Tsai Eison came from Malaysia to pursue his dream as a singer and recently opened a Malaysian restaurant in Taipei City's Zhongshan district. 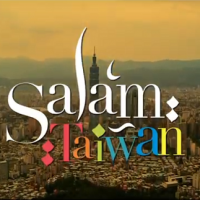 Tsai Eison (蔡艾成) set foot in Taiwan 20 years ago from the city of Kuching in East Malaysia. In order to accomplish his musical dream, he has been through ups and downs. Eison has shown his music talent since childhood. At the age of 6, he started to practice piano and won mostly every contest he attended. However, being a champion did not help him to get any record contract. Instead, all he did was covering other songs while hoping that a music producer would admire his talent and signed him. Rather than constantly performing on stage, Eison's father recorded his music then sent the copies to the local and international music companies. With family support and his own persistence, he received a call from a Taiwanese music company which wanted to sign him. At the age of 19, Eison came to Taiwan alone but with a luggage full of hope. When he arrived at the company, he realized that they had different career goals so he postponed the signing of the contract by one day. Eison spent a night to give the deal a thought then the next morning he tried to reach the company, it turned out it was a fraud. The company disappeared and left him alone. The penniless and homeless Eison was too young and proud to ask for his parents' help. Therefore, he started life as a homeless man in the Ximending district (西門町). While his life was full of misery, Eison ran into an owner of a music company who was willing to raise money to finance him. The staff of the company started to look after Eison. However, little did Eison know, the owner was facing financial problems as well. One day, the owner took all the money he raised, which was almost 2 million NT dollars, and disappeared for good. 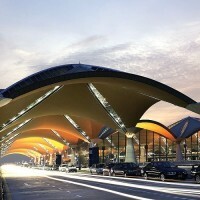 "I was left alone again and felt so disappointed so i decided to head back to Malaysia." said Eison. After returning to his hometown, he and his father planned a new life for Eison. However, other than the music industry, he barely had other experience or skills. Consequently, Eison promised his father that he would do his best to stay alive. 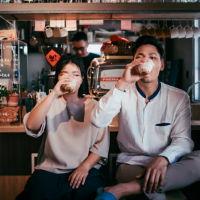 Then he got back to Taiwan and gave his musical ambitions another shot again. His career in Taiwan did not seem to get better immediately. However, his life made a huge turn at that period of time due to his finding religion. Not after very long after that, he was employed by a restaurant as a live singer. He learned quickly and started to have a stable life and income. "It started from no audience listening to me performing because I sang terribly then the manager agreed to give me the hours out of peak time. After a period of time, people could not see any empty seat while I performed." said Eison. With his persistence and intelligence, a music producer spotted Eison's talent and encouraged him to join a singing contest. However, with the bad memory of the failure , Eison rejected his offer. The past was like a sharp knife stabbing Eison’s crusted wound. However, the music producer was persuasive so Eison’s mind was shaky. Later on, Eison participated in a television talent show titled “Super Idol” (超級偶像) which was seeking singing talent. Eison won the championship in season 2 and an album contract. 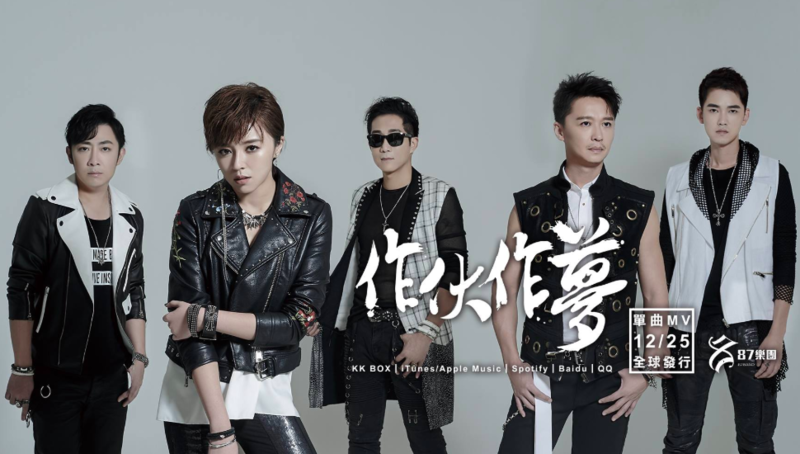 By gaining popularity from the contest, Eison not only won himself a record contract, but a chance to play the television show “Rookies' Diary” (新兵日記). “My role was not an important main role. I just had a few lines, but it seemed very difficult to me. I kept shooting the same scene for 40 times but still could not get it right. So I took the advice from a colleague to get the acting done. The key was alcohol,” said Eison. Eison wanted to act well so with the help of alcohol, he certainly accomplished the job. However, he fell into a new addiction. The pace of Eison’s life was disturbed by his new habits. He was facing alcohol abuse and lack of controlling diet so he became obese and unhealthy. With the help of members from his Church, his renowned actress girlfriend, Wang Tong, and family, he fought the tough battle with the demon. Eison put his life back on the track. 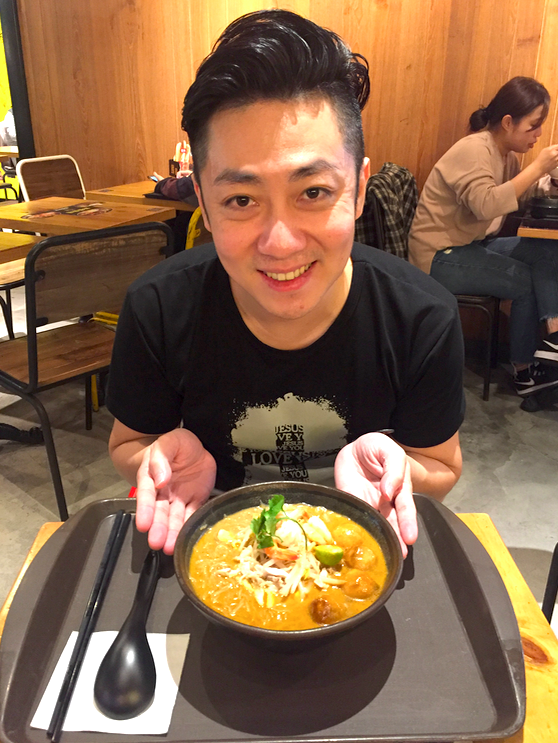 He planned to open a restaurant, E-laksa (艾叻沙), with his friend and family. 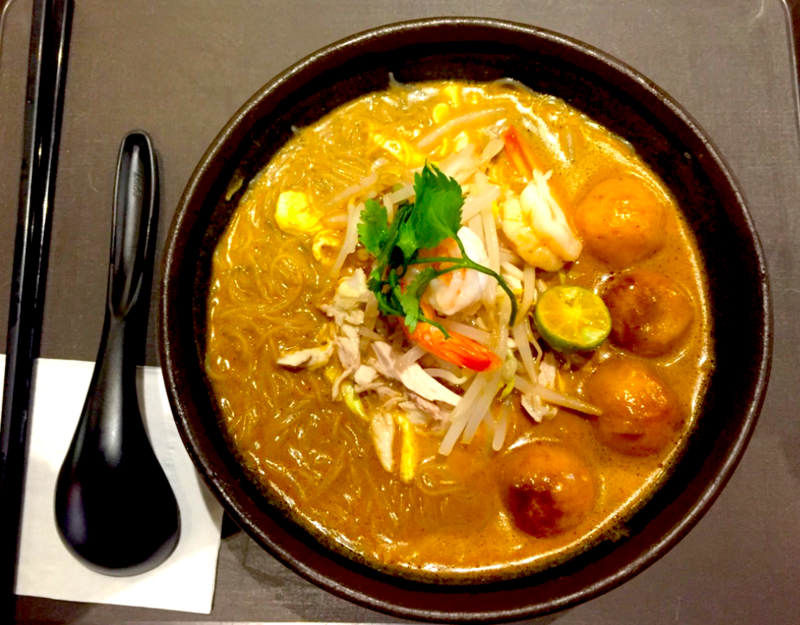 The restaurant’s most signature dish, laksa, is one of the most popular choices in the store. Eison put himself back together and stood up where he fell. The restaurant is located in Ximending, the same area where he started his life in Taiwan 20 years ago and also where he had a horrible homeless life. The most popular dish in the restaurant “laksa” is a bowl of noodle soup that Malaysians eat almost everyday. There are 30 natural ingredients in the soup that form the unique taste. In laksa, Eison replaced the noodle with Taiwanese local ingredients, rice noodle from Hsinchu. Additionally, the delicious South East Asian cuisine includes chicken slices, bean sprouts, shrimp and fish balls. The laksa restaurant has opened a second branch inside the food court, FAVtory (快食尚) in the Zhongshan district. Eison expects to expand the branches nationwide. “Every setback is a treasure in life. Picture the golf ball, the reason it can fly so far is because it has holes,” said Eison. No longer proud, Eison is now religious and a humble man. Other than owning two restaurants, he and his friends formed a rock band titled “87” (87樂團) which just finished a New Year’s Eve concert in Kaohsiung. Additionally, they recently launched their debut album “Dream Together” (作伙做夢).